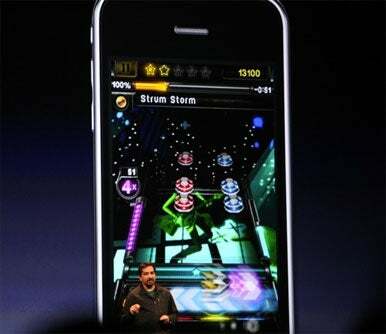 The upcoming iPhone 4 release will dominate the news Monday, but mobile gamers have plenty of reasons to be pleased with what came out of Steve Jobs’s keynote at the Worldwide Developers Conference. A pair of high-profile games will be making their way to the App Store, and both got significant stage time during Monday’s keynote. FarmVille, based on Adobe’s Flash technology, is one of the biggest reasons to play games on Facebook—and now it’s getting its own native app on the iPhone. Meanwhile, wannabe rockstars will finally be able to turn their iPhone into a guitar thanks to a new strumming mechanic built for Guitar Hero on the iPhone. The iPhone operating system’s incapability with Flash has garnered plenty of media attention recently, thanks to a war of words between Apple and Adobe. Now one of the most popular Flash-based games will arrive as a Flash-less iPhone app, so the battle continues. Mark Pincus, CEO of Zynga, announced the iPhone version of FarmVille during the WWDC keynote to a mix of groans and cheers. FarmVille is a real-time social farm simulator with more than 80 million active users. About one in five Facebook users are FarmVille users. That blows pretty much any other Flash-based game out of the water. According to Pincus, the iPhone version will include all the familiar features of the game, including allowing players to use in-app purchases to get cash and coins to purchase things like seeds, animals, buildings, decorations, and vehicles. The game will available at the end of June—just in time for FarmVille’s one-year anniversary. Not only can iPhone users look forward to a new social game coming to the platform, but thanks to Activision, they’ll finally have a fun music game as well. Activision’s Senior Vice President Karthik Bala announced that Guitar Hero has hit the App Store. The $3 app is now available for download. With more than 40 million units sold worldwide, Guitar Hero is selling out arenas while most other music simulation games are playing small clubs. Activision’s Karthik Bala shows off Guitar Hero, which is now available on the App Store. While games like Tap Tap Revenge and Rock Band have proven the iPhone can do rhythm-based music simulators, so far there hasn’t been anything that has captured the feeling of actually playing guitar. That may change with Guitar Hero, if Monday’s demo is anything to go by. Showing off the app, Activision senior vice president Karthik Bala was able to strum his iPhone like it was a Fender Stratocaster. The iPhone game comes with classic rock songs by Queen and the Rolling Stones as well as more contemporary rock anthems like those from Vampire Weekend and Rise Against. Bala explained that you can post high scores on Facebook and customize your rock star’s look, sharing your unique style with your friends. With more than 225 million apps on the App Store and over 5 billion app downloads, the iPhone is a booming marketplace of ideas and entertainment. The ability for developers to create and sell their games in a competitive market is a big reason for the iPhone’s popularity and why the iPhone continues to dominate the mobile market. It wasn’t too long ago that people thought Apple didn’t “do” games. Now you see Steve Jobs sharing the stage with gaming developers when Apple promotes its new hardware. It is, indeed, very cool.